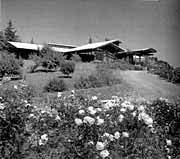 The Clarence H Wylie home designed by Harwell Hamilton Harris, overlooked the Ojai Valley – 1948. Graduating from San Bernardino High School, and then attending Pomona College, Harris enrolled in the Otis Art Institute. Sculpture would hold his interest for sometime. He had a desire to lose himself in his art. Harris had ruled out architecture as a life interest for it did not constitute a work of art, it was for practical purposes and too impure to be called art. The Wylie House porte cochere reaching to the drive with its exposed roof overhead – 1948. However, while at the Otis Art Institute, he was treated to a visit to Frank Lloyd Wright’s “Hollyhock” house and was spellbound. The house had low walls and wings that came toward you and away from you and were paralleled with bands of hollyhock ornamentation, which was repeated above the window line and ledges. Harris felt that the house was, indeed, a sculpture, but on a completely different scale. With a new desire to now join the architectural world, Harris was introduced to the well-known architects Rudolph M. Schindler and Richard Neutra. Neutra was in need of some help in the office and persuaded Harris to join them; his first desk was a drawing board resting on an old trunk in the corner of their drafting room. In 1928, Harris helped Neutra with one of his first modern buildings, the Lovell Health House. The experience gave him the true aspiration to become an architect and, clearly, Harris was taken by the modern style of architecture. It was in 1932 that Harris received his first architectural commission – from an old friend and classmate at the Otis Art Institute. He hired Harris to design a house for him and his wife. The plan was L-shaped with a courtyard, steel-framed, with wall panels and a flat roof, much like the clear shapes and clean spaces of the Japanese houses – a quality that became characteristic of all later Harris’ designs. Harris had seen many houses in California constructed with board-and-batten exterior walls, and to him they did not appear cheap, but rather an inexpensive form of construction. Left unpainted, they appeared even more Japanese. In 1933, Harris noticed beautiful houses around the Pasadena area that were low, one-stories constructed of redwood boards and battens. On inquiring as to who the designer was, he was informed that they were done by brothers named Greene. Harris had not heard of the brothers, but certainly admired their work. Jean Murray Bangs would become Mrs. Harwell Hamilton Harris in 1937. With her interest in architecture, she had quit her job and became Harris’ full-time assistant. The Greene brothers would hold a fascination for her as well, and she set out to view as many of the Greene brothers’ buildings as possible – and she was interested in learning if the architects were even still alive. Jean Harris studied every publication that she found on the Greene brothers and uncovered all the information she could. She searched for any trace of the brothers, looking through all the telephone books and directories for any listing, but she found no help. Even the American Institute of Architects could not give her any information on the brothers; apparently, they had given up their membership in 1915. Not giving up, Jean Harris was finally able to locate Henry Greene’s daughter, and she drove to her house. There, she also found the architect. She inquired as to the whereabouts of the many drawings that he and his brother had done over their years in business and was told that they had left them all, perhaps as many as 400, in the garage of the last house in which they had lived. Inquiring with the owner of the house, she found that he had no objections to her searching the garage for the drawings. And, so it was that in a run-down cabinet in a rat-infested area of the garage, she found the many drawings. Jean Harris then had their friend Henry Eggers (the architect of the Ojai home of historian and author David Lavender) photograph all of the Greene and Greene houses and organized a traveling exhibition. She documented the lives of these forgotten men and, subsequently, the information is available to everyone. Through her efforts, the American Institute of Architects bestowed a special award upon the now-famous Greene and Greene brothers. In 1946, Harwell Harris received a commission for a hilltop home in Ojai Valley for Mr. and Mrs. Clarence Wyle. In the Wyle house, Harris found that it would be more interesting to reveal the structure of the house and, for this reason, the gable roof became a favorite new element. “I like not having the boxed-in eaves that I usually had with the hipped roof,” Harris said. By using rafters that were 2 inches deeper in the open sections, he assured himself that they would never appear as if part of the roof had been “blown off in a storm.” The 2 inches would make the extension appear bold and intentional. The extended rafters were dramatically exploited in the Ojai house, which was being constructed in a mountainous region. Harris presented a plan with four wings going out from the center of the house into the graceful landscaping to afford each room a spectacular view of the Ojai Valley. The plan also allowed for the major rooms to have glass walls on three sides. The living room was inviting with its built-in sofa, a modern inglenook, and a warming fireplace. The built-in bookcases would add to the informality of the great room, and the master bedroom with its brick fireplace helped to recreate intimate spaces within the house. One gabled wing, a porte cochere reaching to the drive, had an exposed roof construction overhead and a rock wall with built-in bench below. It was a clear homage to the Greene brothers. After World War II, the Harrises decided to make a change in their lives. Harris accepted a position as director of the newly formed School of Architecture at the University of Texas. He had taught at a number of schools, but the thought of teaching on a permanent basis had never entered his mind. Now, he was not only an architect, he was to be the director of the entire school. Jean Harris became involved with the magazine House Beautiful. She wrote many articles for the publication and, for a time, was even listed as food editor. Many of her pieces were about architecture and the modern home. The last years of Harwell Hamilton Harris’ life were spent educating young architects, and his art continues to draw the respect that it so deserves. “With its form the building satisfies the user’s wants – conscious and unconscious. It anticipates, it invites, it implements those wants. So whatever the indweller now does he does effortlessly, harmoniously – doing what great art does in music, in literature, in mathematics, in painting, in sculpture: creating a great unity. Doing this is what makes architecture worthwhile.” – Harwell Hamilton Harris, 1977.